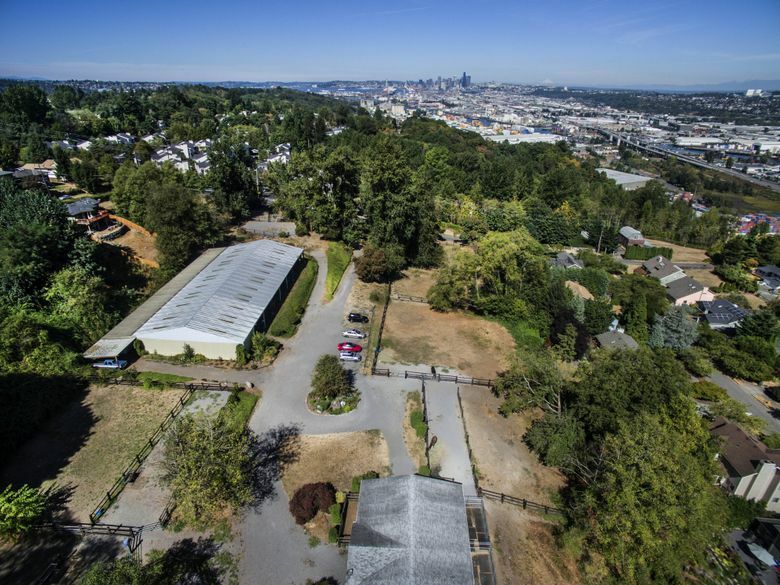 The property on a Southwest Seattle hill is up for sale for $7.6 million, and a developer could conceivably build about $13.5 million worth of houses on the site. 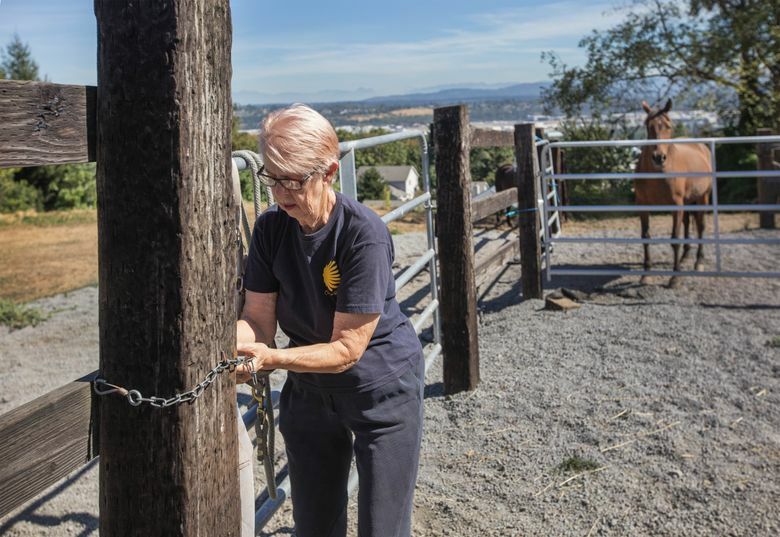 Nestled on the hillside above South Park is Seattle’s very own horse farm, a bucolic setting where you can see the bustle of downtown but the only sound is the buzz of the birds overhead. Yes, Seattle has a large horse farm tucked into its city limits, complete with dozens of stables, a riding arena, gardens and even a resident three-legged cat that sometimes rides the horses. But soon this chunk of Hidden Seattle will likely be paved over, replaced with about two dozen pricey homes. The longtime owner of the property, Dr. Jean Nokes, began buying up the 4.2-acre site in West Seattle 47 years ago. It was just below her childhood home in what is now the Highland Park neighborhood, but was then just a few homes and dirt roads. 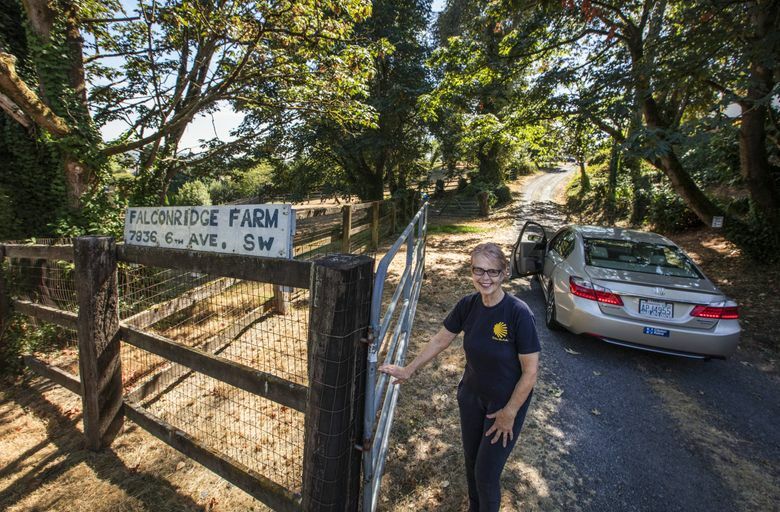 She and friends built the stables and arena and boarded a dozen or more horses at a time at what they call Falconridge Farm. Now in her 70s and no longer riding, Nokes says she is no longer interested in taking care of the property. Last month she put it up for sale, asking $7.6 million. She wants to sell it to someone who will keep the equestrian farm intact. But the area is zoned for 19 to 23 single-family homes, each across large 7,200-square-foot lots. So far only developers — more than a dozen of them — have come calling. “It would be a shame to have this place all go away,” Nokes said. She hates the idea of selling to a developer but says it’s time to pass the land on — particularly with the property needing about $40,000 in work — and she isn’t willing to let it go for a substantial discount to keep the farm intact. The developers are lining up because it’s so rare to find a large lot left in the city where building prized single-family homes is allowed. It’s among the biggest plots on the market in Seattle, behind the Talaris Campus for sale in Laurelhurst, another potential homebuilding site. The typical newly built home in West Seattle sells for about $708,000 now. That would put the total value of the mini-neighborhood that could replace the farm at about $13.5 million. The listing itself is unique. Estately, a Seattle-based real-estate site, searched all listings from the past five years involving large lots that included terms like “horses” and couldn’t find anything comparable. “There’s nothing within the city limits with this size and this kind of situation,” said the listing agent, Boni Buscemi, of Realogics Sotheby’s International Realty. 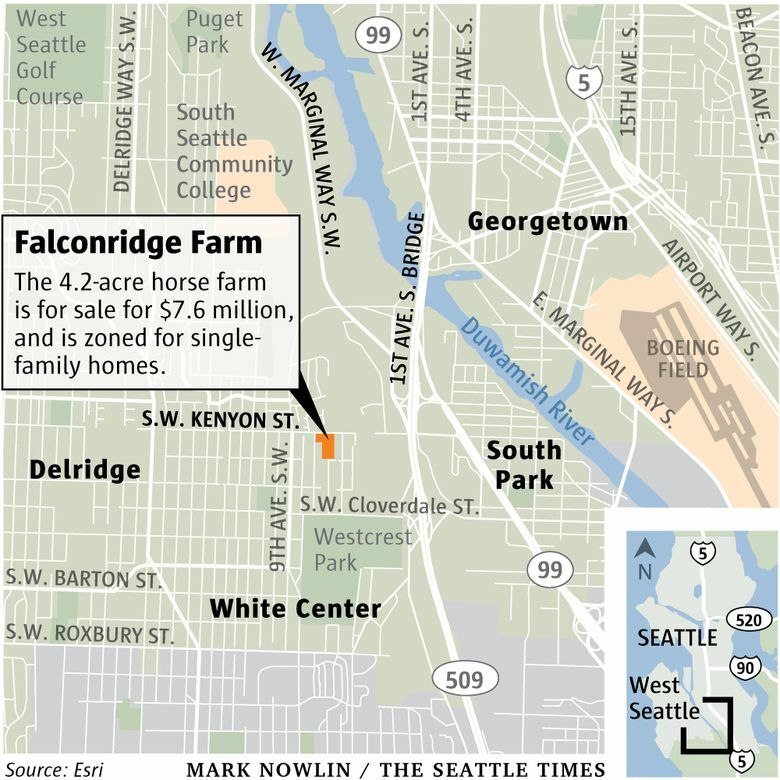 There is at least one other large horse farm in the city, however — a Rainier Beach property that caters to families, and is not for sale. Now there are just two horses, including 28-year-old Cielo, and Nokes’ older cat, Luna, who had a leg amputated years ago. Cielo and Luna are great friends, said Nokes: In their younger days Cielo would nudge Luna while she was sleeping as part of a routine to get the cat to jump on the horse so the two could go for a ride together. The views from the farm are spectacular: Mount Rainier and the Cascades to one side, city views to another. You can watch the planes at Boeing Field down the hill. Potential downsides for buyers: It’s on a slope, which could bring about challenges with the city and with engineering. New owners are also likely to face the ire of neighbors. After the West Seattle Blog wrote about the listing on Friday, commenters left notes on the story saying how upset they were and Buscemi heard an earful. And if the property is converted to homes, Nokes said, a tax bill of $500,000 will come due. (Nokes says she will pay it). 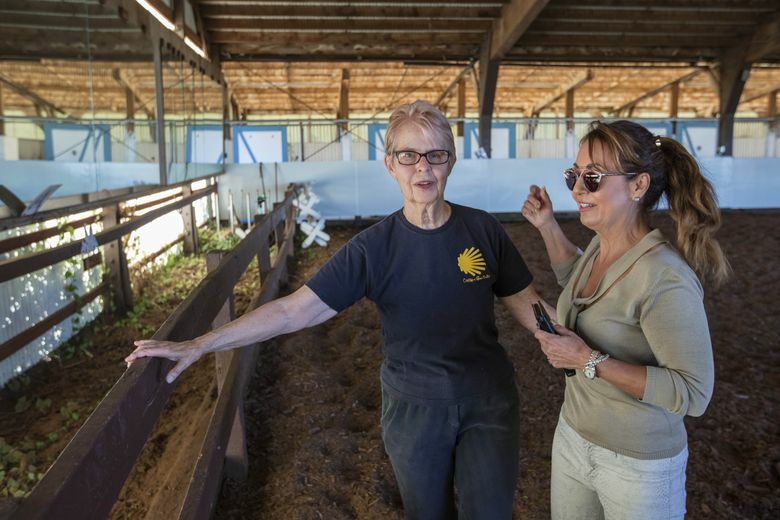 The property-tax bill was once $25,000 a year, but she got that dramatically reduced after the county reclassified the property as agricultural land, she said (there are no homes there). Buscemi and Nokes said they’ve received a loose proposal from the neighborhood to form some kind of nonprofit to buy the land, but they haven’t produced any money, they said. So far, “They don’t have a pot to piss in,” Buscemi said. The farm was featured in a Sunday edition of The Seattle Times in 1970, but otherwise it has been a pretty well-kept secret. Nokes said most people have no idea it exists. Even an internet search for the farm yields next to nothing. Buscemi expects to have a deal in place by spring, allowing for developers’ long leeway time to conduct due diligence and draw up plans. Corrections: This post has been updated to include more information on the tax burden for a potential sale, and to correct Nokes’ age.